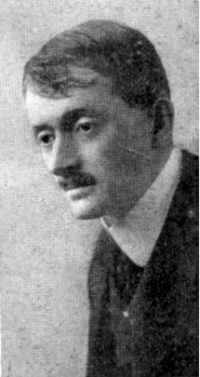 John Masefield (1878-1967)—Jack to his childhood family, Jan to his adult friends—was the Poet Laureate from 1930 until his death. He is remembered for poems like “Sea-Fever” and “Cargoes”, but also for his two fantasies for children, The Midnight Folk (1927) and The Box of Delights: Or, When the Wolves Were Running (1935). Masefield was born in Ledbury in Herefordshire; it was a Paradise, he would say. But his mother died after the birth of her sixth child in 1885, and his father, a solicitor, died in 1891 after a long period of mental instability. The young John and his siblings were looked after by their aunt and uncle. When he was ten he was sent to Warwick School as a boarder; he stayed for three years, but was then packed off to HMS Conway in Liverpool, to train for a career at sea. His aunt had thought that a man’s life at sea would cure him of his addiction to reading, but he soon found that life in the Merchant Navy left him plenty of time for books—that is, when he was not being sea-sick. He travelled to Chile via the Cape in 1894; he was hospitalised for sunstroke, discharged from the ship and returned to Britain as a DBS (distressed British seaman). His aunt was horrified, and insisted that he should try again. He secured a position on another four-master, the Bidston Hill, and went to New York by the ordinary mail-ship to join it. When the Bidston Hill left New York, Masefield was not on it. He had jumped ship. His uncle hired a firm of private detectives to find him, but they had no success. For a while Masefield lived as a vagrant; when he drifted back to New York in summer 1895 he took a job as a barman. There he read the only book he had: the first volume of Malory’s Morte Darthur, which he had picked up in a 6th Avenue bookstore. In September he moved out of Manhattan and began working in a carpet factory in Yonkers. For two years he read voraciously, discovering Chaucer and classic English poets. He began writing poetry himself in 1896, and began to think that if he wanted a literary career he could not do it in Yonkers. He conned his way into a job as a steerage steward on board a ship to Liverpool in 1897; the captain was a graduate of HMS Conway. I landed in England with about six pounds and a revolver. I was going to try to get myself a job as a clerk (I knew nothing of business). Failing that I was going to shoot myself. I was desperately ill and sick. I hadn’t the strength to stand more hardships (quoted by Smith, p. 49). He came to London, and at the beginning of 1898 one of his mother’s brothers found him a job in a bank, where he stayed for three years, gradually recovering his health. He continued reading, of course, and became a fan of W.B. Yeats’ poems. He wrote to Yeats in 1900, who invited him to a meal in Bloomsbury, and who began to introduce him to others in the London literary world. Through Laurence Binyon and William Rothenstein he secured a job organising an art exhibition for Wolverhampton in 1902. That year his first volume of poems, Salt-Water Ballads, was published, and he began to establish a considerable reputation. He dedicated the book to three women, one of whom was Miss Constance de la Cherois Crommelin (pronounced Lashery Crumlin, Ms Smith kindly informs us: p 74). He had met her just before leaving London for Wolverhampton, when he was 23 and she was 35. She had studied at Newnham College, Cambridge, and had a private school in London. They married in 1903, and went to her native County Antrim for their honeymoon. He was able to devote himself to full-time writing, when not helping to look after their two children (after the birth of the first in 1904 a visitor noted that he was “slowly realising which end of the baby Judith is to be held upwards”: Smith, 87). His first play, Nan, was produced in 1908; his long narrative poem The Everlasting Mercy was published in 1911: “a landmark in English literature as well as in his own life,” as Smith comments (105), “incomparably the finest literature of the year”, said J.M. Barrie. He toured America twice as a lecturer (for more details, see his war experiences). Both Harvard and Yale awarded him honorary doctorates, as did Oxford in 1922. After the war he and Constance sold their London house (in Hampstead) and their old and leaky Lollingdon Farm, in Berkshire, and settled in Hill Crest at Boar’s Hill, near Oxford, and divided his time between amateur farming and writing. His Collected Poems sold 80000 copies soon after publication in 1923, and many more copies by the end of his life. He wrote novels, poems, and plays. In 1930, he (rather than the expected Rudyard Kipling) was appointed Poet Laureate, and he produced many poems in his official capacity. His wife died in 1960, and he himself died, of gangrene resulting from a split toe-nail, in 1967. His ashes were placed in Poets’ Corner, Westminster Abbey. David Gervais wrote the brief biography in Oxford Dictionary of National Biography; the standard life is Constance Babington Smith, John Masefield: A Life (Oxford: OUP, 1978) (I cite the 1985 Hamish Hamilton paperback).